One of my athletic goals for 2019 was to run a 5k under 21 minutes again–something I had not done since October 2016 in Florida, at sea level. That’s more than two years ago. I came tantalizingly close last year when I clocked the first five kilometers of a four-mile run in 21:01, and otherwise was even less close-but-no-cigar on every other occasion. 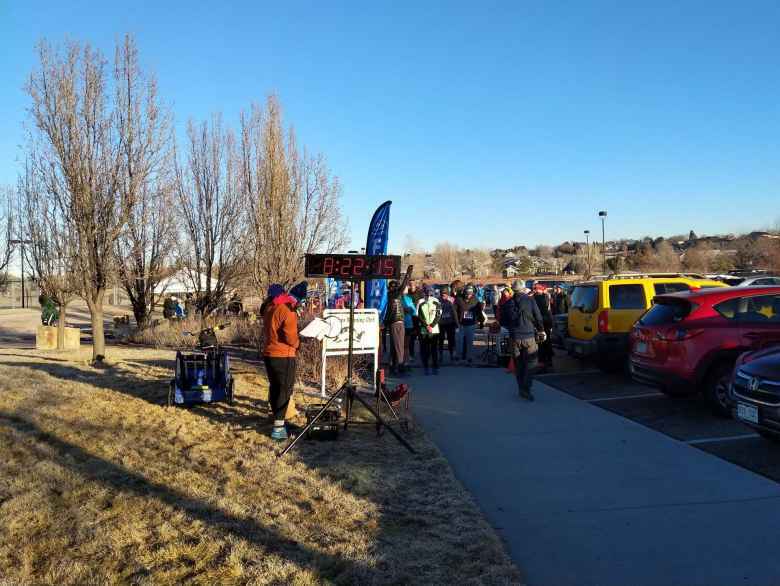 Thirteen not-so-unlucky 13 days into the new year at the Fort Collins Running Club’s Fossil Creek Park 5k Tortoise & Hare race, I did it! It just took near-perfect weather conditions with still air, bright sun and a “balmy” 25 degrees Fahrenheit. As usual, I ran a good first mile (6:32) and a fatigue-induced slower second mile (7:02). The difference today, then, was a decent third mile (6:47) that was punctuated by a 200-meter sprint. I was definitely tired but I had enough internal fire to make those legs push myself ahead of other T&H-ers—instead of hypnotically keeping pace with the ones that had started before me. With the sub-21-minute 5k goal achieved, it may be reasonable to think about sub-20 again. Or before jumping too far ahead of myself, run sub-21 again and establish a pattern of consistency. As it would turn out, I’d have a chance to try to do so the following week, albeit on a more difficult course.